Android and iOS have always faced tough competition, winning over users and application developers, while surpassing all minorities of minutest bugs. There have been times when Blackberry and Windows phones added immense competition in the mobility world. But over the years, Google has improved the Android platform by leaps and bounds. Android has thus emerged to be the most powerful of smartphone platforms. Several app developers are working on this open platform to offer highly immersive and intuitive app ecosystem. The multitudinous resources being deployed over one platform has definitely led to its becoming the best operating system available for smart devices that require connection with internet round the clock. Multitude of Android phones in the market: Huge variety of Android phones providing different components and screen sizes, is available in the market. But it often becomes a menace for developers finding different solutions for different hardware specifications. Several of IT organisations are involved with mobility best solutions and their timely devotion to Android development has led to a big win for consumers. Different phones offer different functionality. Some come with long lasting battery life, some add explicit glitz and show to the smartphone usability. Progression of Android versions: Since 2009, Android has undergone immense development with versions like Cupcake ( 1.5 ) , Donut ( 1.6 ) , Eclair ( 2.0 – 2.1 ) , Froyo ( 2.2 – 2.2.3 ) , Gingerbread ( 2.3 – 2.3.7 ) , Honeycomb ( 3.0 – 3.2.6 ) , Ice Cream Sandwich ( 4.0 – 4.0.4 ) , Jelly Bean ( 4.1 – 4.3 ) and Kitkat ( 4.4 ), being released from time to time. Android gives users the freedom to dwell in the device and use it the way they want . iPhones lack innovation: Features like NFC for bluetooth pairing, wireless charging, removal of batteries etc. are not present in iPhones. The best part of iPhones is still its camera , although Android is catching it faster even in this aspect. With the onset of an era where we are going to be covered by smartness of devices from head to toe, Android is going to take the world with storm by establishing its presence in every nook and corner of the planet. iOS is no where in all of this, only witnessing yearly releases of its smartphones every year. Smart devices are not just about smartphones now. The usability has expanded itself to a plethora of devices like upcoming smart watches, home monitoring systems, smart TVs, smart cars and so on. 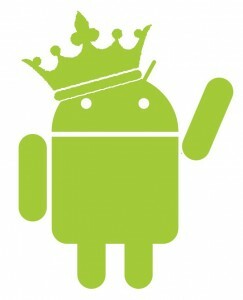 Consequently, it is Android that holds the mobility future and not iOS.